Death of Fr. Flann Daffy, C.Ss.R., April 26th, 2015. Yes kindly extend our prayers and condolences to Fr Flan’s loved ones and the confreres. Fr Flan is gratefully remembered. We are now sharing here our numerous stories about Fr Flan especially those whom he has worked with. May he now watch over us. And may we share in his apostolic energy. Indeed he was a big man with a big heart for the ordinary people. The simple folks here easily remember him. I remember that in the Archdiocese of Palo, among the clergy, he was considered as an “institution”. He indeed helped in what the Province has become today. Funeral Mass of Fr. Flannan Daffy, C.Ss.R. The funeral Mass took place today, Wednesday April 29th, 2015, in Esker, near Athenry, for Fr. Flann. Present were his two brothers, Alan and Andy, with their wives Clare and Nan respectively. Present also were his two nephews and their wives, David and Aoife, Aidan and Ann, together with Sorcha and Tara, children of Aidan and Ann. Other relations, cousins, and friends of Fr. Flann attended. The Celebrant of the Mass was Fr. Dan Baragry C.Ss.R. Provincial of Dublin Province: the preacher was Fr. Pat Horgan C.Ss.R.. Bishop John Kirby presided. Both Frs. Dan and Pat had worked in the Philippines, and Fr. Pat was a specially close friend of Fr. Flann. Present also on the altar was Fr. Carlo Conde, currently based in London, who hails from Tacloban, and whose family were very close to Flann. Fr. René from Tacloban (currently in Dublin) attended, with some Filipino friends also. Quite a few Redemptorists were in attendance, from the different houses of the Dublin Province, and others were present last evening for the removal. Fr. Tom Shanahan, Carmelite, attended (having known Flann well over many years in Tacloban). as well as a number of other priests from the Clonfert Diocese, and from Tuam Archdiocese, and one Columban priest, a neighbour from near Esker. May the Lord let his face shine on you, Fr. Flann, and take you ‘to the bosom of Abraham’. Fr. Flann Daffy, on St. Patrick's Day 2015.
of Fr. Flannan Daffy, Redemptorist, a member of this community in Esker, Athenry, County Galway. May his dear soul rest in peace. Fr. Flann died in University Hospital Galway at 13.45 hrs today. He had been in hospital for about nine days, and became seriously ill on Thursday evening last. Since that time, somebody has been by his side continuously. Fr. Flann, in the Philippines. Ordination, Fr. Flann went to the Philippines, and worked in that mission for about 55 years. He returned to Ireland over three years ago, and has been in our Esker community since about that time.He is survived by two brothers, Alan and Andy, two sisters-in-law, Clare and Nan, and two nephews, Aidan and David and their families. 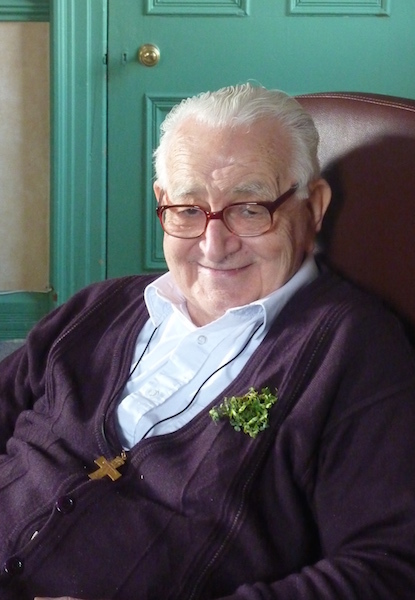 FUNERAL ARRANGMENTS: Father Flannan Daffy, C.Ss.R., Redemptorist Community, Esker, Co. Galway, died peacefully at University Hospital Galway, Sunday 26th April 2015. Deeply regretted by brothers, Alan and Andy, their wives, Clare and Nan, nephews David and Aidan, their wives Aoife and Ann, grandnieces Sorcha and Tara, grandnephew Joe, his Redemptorist confrères, his many friends, and those he ministered to over the years (especially in Tacloban, Cebu and Iloilo). Reposing at Esker Monastery, Tuesday, 6.30 pm -7.30pm, removal to Esker Church at 7.30pm. Funeral Mass at 12 noon in Esker Church on Wednesday 29th of April; burial in the community cemetery.He is deeply regretted by his Redemptorist confreres, in the Philippines and in Ireland. Ar dheis Dé go raibh a anam dílis! Fr. 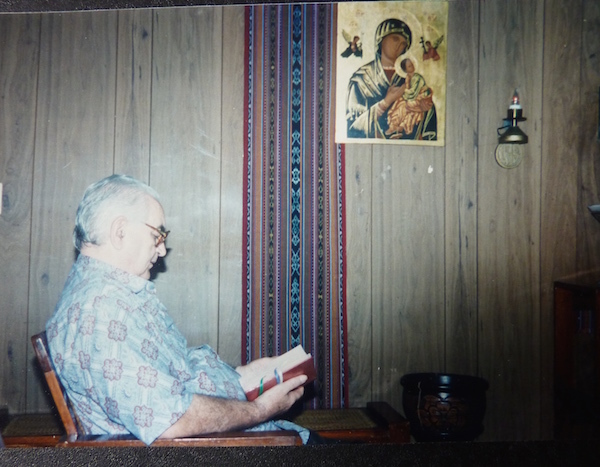 Flann in the Philippines,- he spent over 50 years ministering there. Flann, a man of prayer. ← Esker ‘Family Mass’, Sunday, April 12th, 11am. 22 Responses to Death of Fr. Flann Daffy, C.Ss.R., April 26th, 2015.
when i stumbled,fell and lost my self-esteem for awhile,your embrace brought back my being. You were in Ireland then but as soon as you came back,your personalized letter and token for me weren’t enough because you looked for me. When all i could give you were my guilty tears and my humble apology,you said nothing but instead gave me a tight hug. “Look Jenny,the Church is not for saints but for sinners…there are no ‘WHYs’ for me now but WHAT’S NEXT? I may have failed to answer your significant question but you compassionately read the cry of every drop of tear I shed. Your full confidence in my “not so typical” decision blew away the fears clouding over me. Your second assuring hug said it all. Thank you very much Fr.Flan Daffy for being the good shepherd who went out of his way to look for the one lost sheep. I thank God for the gift of person I have in you. So sad to hear of Fr. Flan’s passing. I remember him as the smiling priest who celebrated our baccalaureate mass in my elementary graduation in Tacloban City. May you rest in peace Fr. Flan. My family and I are very sad and shocked to hear of our dearest Fr. Flan’s passing. We will truly miss him. 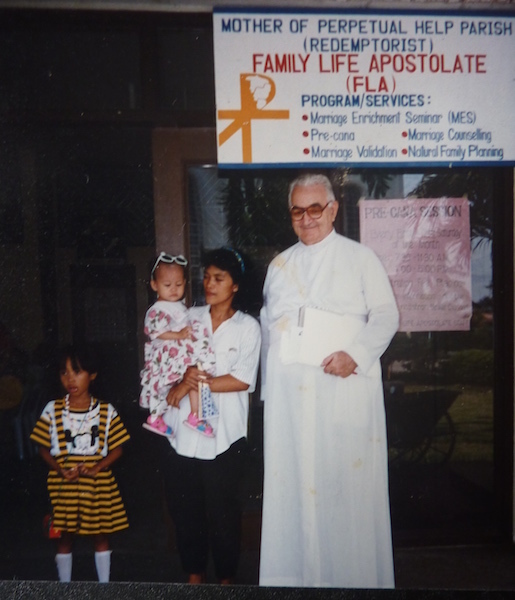 He co-officiated at our wedding in Cebu, baptised both our children and always found time to visit us over the years. We always got the warmest welcome whenever we visited him too. We extend our deep and sincere sympathy to Fr. Flan’s family and the Redemptorists who looked after him so well. Dear Fr Flann, THANK YOU so much for your smile and your kindness, every time I came to Esker! Thank you for everything. You may not know me personally but you have been a constant presence in my growing up years when we use to hear mass at Redemptorist church in Tacloban. I will never forget your smiling face. Rest in peace. 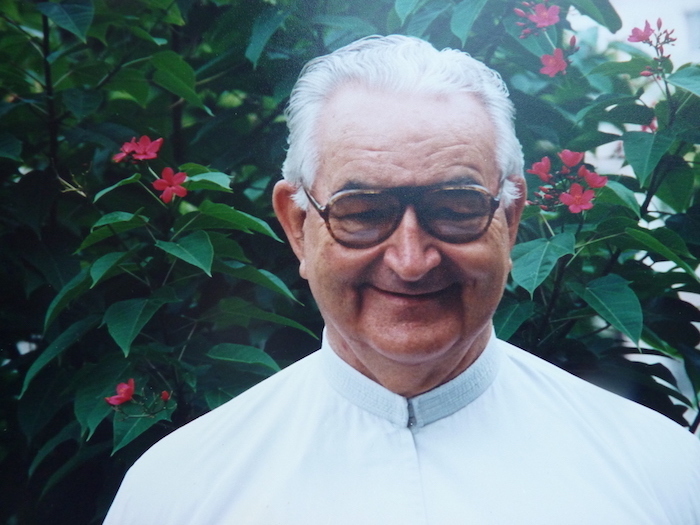 Fr.Flann Daffy established the St. Joseph Parish in San Jose, Tacloban City. He conducted catechism to some volunteer catechists (one of which is my mother) I remember in my childhood I would always look forward to attending Holy Mass every Sunday because I know Fr. Daffy is the presider. Not only because is a foreigner, but also because his homily touches my heart that its almost like listening to Jesus. After the mass he would walk down the center aisle and children like me would rush to get his blessing. I would ask for his signature in my mass card. Thank Fr. Daffy for the soulful memories you have left us. This Old Man, who would always look down on me and say,”Hey, an gutiay nga babaye, kumusta?” wearing his enigmatic smile. I will not forget him. May the good Lord grant him his eternal repose. Rest in peace, fr. Daffy and let perpetual light shine upon you. Taclobanons are forever grateful to you. This is sad news. Rest in Peace Beloved Priest and Friend. May Fr. Daffy rest in peace. I knew him in Tacloban and Iloilo. We will miss you Father Daffy! May you rest in peace. Growing up, you and other Redemptorist fathers were always at our house during special get togethers. Fr Daffy was the founder of Perpetual Help Credit Cooperative Inc (PHCCI) which served millions of Leytenos. A great loss to the redemptorist parishioners. May his legacy be our inspiration in making our place a better one. Your good deeds lingers us forever. Fr Flann Daffy will be missed by millions & millions of people…We thank you for your over golden years stay in the Philippines especially in Tacloban City where you served as Parish Priest of Redepmtorist Church. We pray for the eternal repose of his soul and let perpetual life shine on him..Rest in peace. AMEN. May you rest in God’s peace Father Daffy! My sincerest condolences to the family. He became a family friend since the 60s when he was at Tacloban City, Leyte, Philippines. My maternal grand father served the Redemptorist church and became close with Father Daffy and so the rest of the family became his family. We last saw him in 2002 in Iligan City, Philippines. Thank you for the friendship Father Daffy! You will be in my prayers! rest in peace Fr. Duffy. I use to hear his mass at my local church in marasbaras, tacloban city every sunday at 7:30 am. he was fluent in my local language. I’m here in dublin 14 years and didn’t get a chance to see him again. may the heaven and angels embrace you upon entering His kingdom. Amen. Flan is now in heaven. I was with him for many years in Tacloban and on the missions in Samar. I owe a lot to him for his kindness, good example, his energy and enthusiasm, and perhaps most for his example to me as a man of prayer. That is why I have no doubt in saying – “Flan is now in heaven”. Thank u fr. Flan for ur love for us Taclobanon. .We miss you..May u rest n peace..
Fr. Flann Daffy was a family friend. My parents served as volunteer marriage counsellors in the Mother of Perpetual Help parish during his time as Parish Priest in Tacloban City. He was a pillar in my parents’ community service and our family’s spiritual life. May he rest in peace in the hallow of God’s hand. Thank you, Father Daffy. We will miss you in Tacloban.